The accommodation briefly comprises four bedrooms; two doubles (one en-suite and a larger master bedroom upstairs) and two singles; one at the front and one at the rear, both the same size. 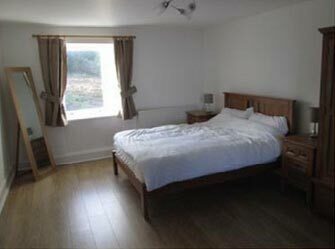 Bowmore holiday home can therefore accommodate any combination of up to 6 people. There's a family lounge at the front, with a corner sofa and modern easy chair. Television is provided by Sky, while bt wifi broadband is available throughout the house. The family bath-room is upstairs, with a shower over the bath and the fully fitted kitchen looks out to the newly landscaped garden. However, as there's an en-suite shower room on the ground floor, and it's right next to the kitchen, now even people with limited mobility can also enjoy a full family holiday on Islay. We've tried to make this house a home-from-home; somewhere that's convenient for everything you might need and a great base to be able to venture all over the island. The garden can be enjoyed by the whole family and the path from the back door has been deliberately designed for someone with limited mobility to be able to get out to the garden too. Access to the rear of the house is also available via an archway on the left-hand side. Car parking is available right along the other side of the road.